We cater for all types of events from a few friends getting together up to a large corporate gathering. Although we tailor each tasting to the requirements of our clients we can also offer 3 different whisky menus with the number of drams ranging from 3-6. For groups where the bulk of attendees might just becoming introduced into the magical world of whisky, or have a little knowledge we can offer our Introductory package of drams, which will still be enjoyed by the more knowledgeable whisky buff. 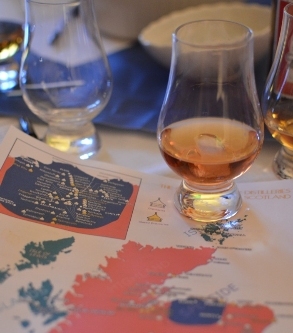 Many people have already acquired a taste for the intricacies of aromas & flavours that a fine malt whisky can bring and are perhaps seeking something new & interesting that perhaps they haven’t had the opportunity to try before; therefore the Standardtasting can cater for the more experienced palate. The Connoisseur selection will offer some unusual, perhaps rarer single malts and grain whisky’s that those participating might have aspirations to try, thus we can give them an experience perhaps not appreciated previously. Whatever type of event you require what we do provide is a fun, enjoyable & informative time. Tasting & discovering new whiskies amongst friends or colleagues is a great social occasion giving everyone involved a relaxed & friendly environment & hopefully leaving with a cheery glow!!!! So if you’re looking for a completely different & unique occasion then please get in touch to find out more or to discuss your preferences.